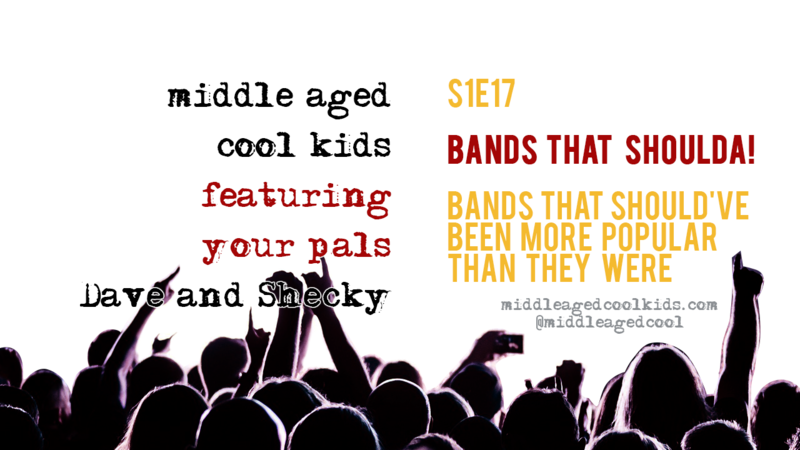 MACK #17: Bands That Shoulda! Bands That Shoulda! AKA Bands that should’ve been more popular than they were. The other day I [Shecky] was digging through the internet looking for a piece of music to go with a video I was editing. I went down a rabbit hole of sorts, searching for music that was edgy, cool but not necessarily known by everyone. And although my search ultimately led me to use a different kind of music entirely in the project, it did get me thinking about bands who never fully lived up to their potential. Or maybe bands who Dave or I may love, that haven’t gotten nearly as much exposure as some of their contemporaries. Or bands that are popular in another country but not ours. Dave picked four that I’d never heard of at all. I liked 3 out of 4 of them. Especially one song I’m sure you can imagine how he felt about my picks. Enjoy the show! This one was a lot of fun for us. ← MACK #16: Scrutiny! Dave on Various Top 10 Drummers of ALL TIME lists.